The easiest way to tell if you've caught a sheepshead or a black drum is to look at the chin. 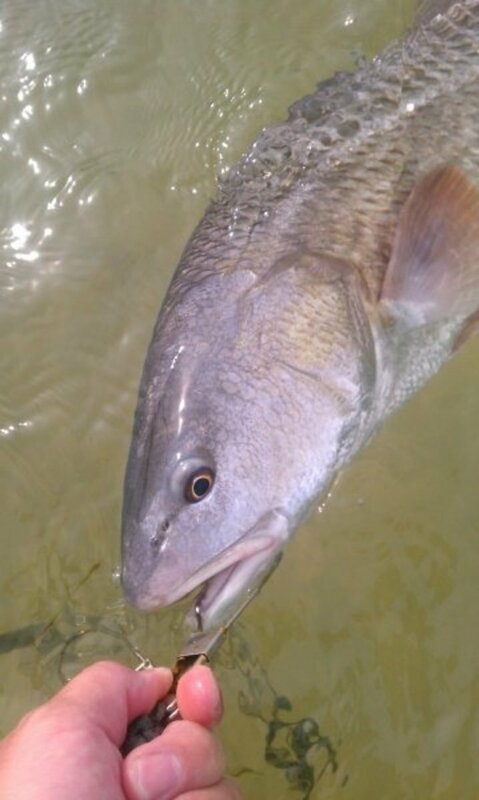 A black drum has barbels under the mouth and a sheepshead doesn't. Sheepshead, also commonly called sheephead or convict fish, belong to the Sparidae or sea bream family. They are found in the western Atlantic from Nova Scotia to the northern coast of Brazil, and throughout the Gulf of Mexico. 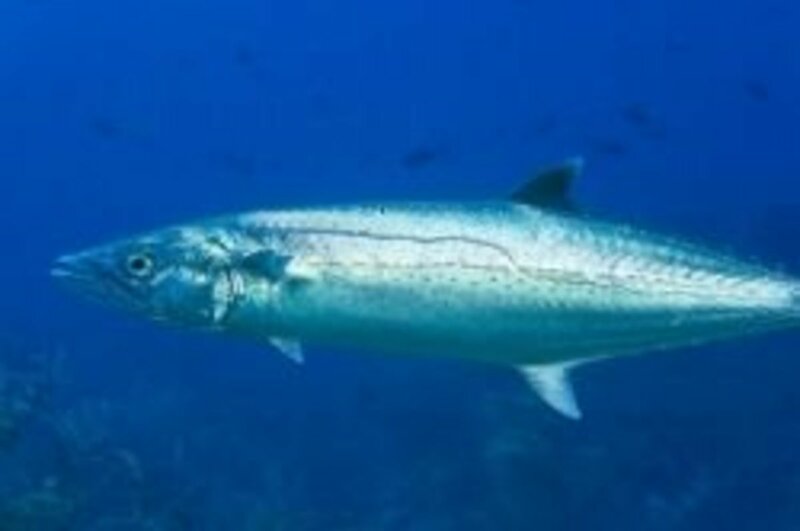 They are most abundant in the Gulf of Mexico, particularly the Florida Gulf Coast. They are year-round residents and often a targeted species in the cooler months. Sheepshead are very structure-oriented fish, particularly favoring structures with large growths of barnacles or oyster beds. Common habitats include rock piles, mangrove forests, oyster bars, dock and bridge pilings, near-shore natural and artificial reefs, and navigational buoys. They are tolerant of fresh water and can often be found in brackish water areas, and sometimes even spend short periods in freshwater streams and rivers. 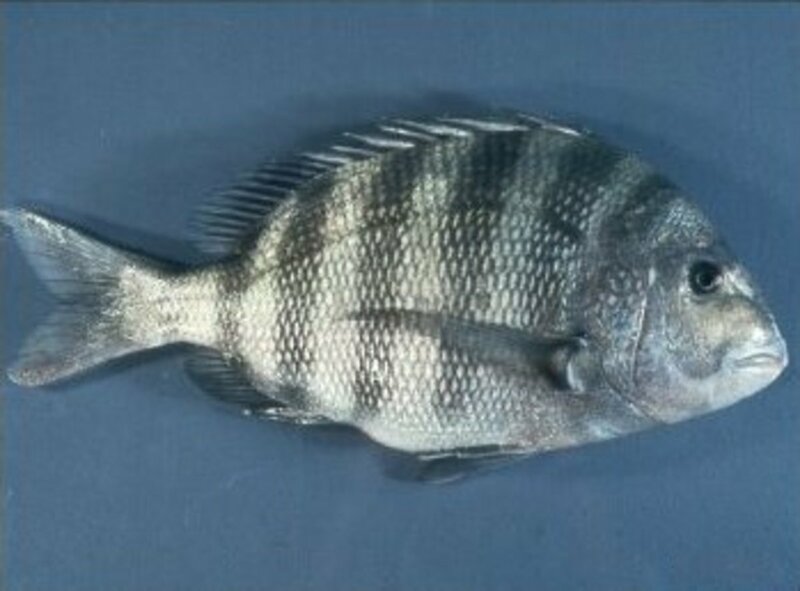 Sheepshead feed primarily on crustaceans, though they will occasionally feed on plant matter and sometimes small fish. Common prey items include any species of small crab, oysters, clams, and barnacles. They use their large strong teeth to break apart the shells of these creatures by nipping at them, crushing the shell, and exposing the soft meat inside. In fact it is the large incisors, which resemble a sheep's teeth, that give these fish their name. The key to finding sheepshead is to find areas with large amounts of crustacean growth, which usually means hard-surfaced areas that give barnacles and muscles something to anchor to. Good places to start are public piers and docks, bridges, jetties and oyster bars. From a boat you can reach navigation buoys, private docks, and submerged rock piles and reefs, especially artificial reefs with large amounts of barnacle growth. Not all structure is created equal though. Sometimes one dock may be completely covered in sheepshead, while the next dock down is empty. A large piling or group of pilings will hold fish, while another piling a few feet away will not have any fish. To further add to the confusion, some pilings or docks will be loaded with fish during a certain tide phase, and then devoid of all life when the tide phase changes. So how do you locate a good dock? Experience. Only through trial and error will you locate good sheepshead holes. The good news is that once you find one, it is likely to be a productive spot for many years. Always keep notes on where you catch fish and when, including additional information such as tide phase, moon phase, water and air temperatures, and time of day. 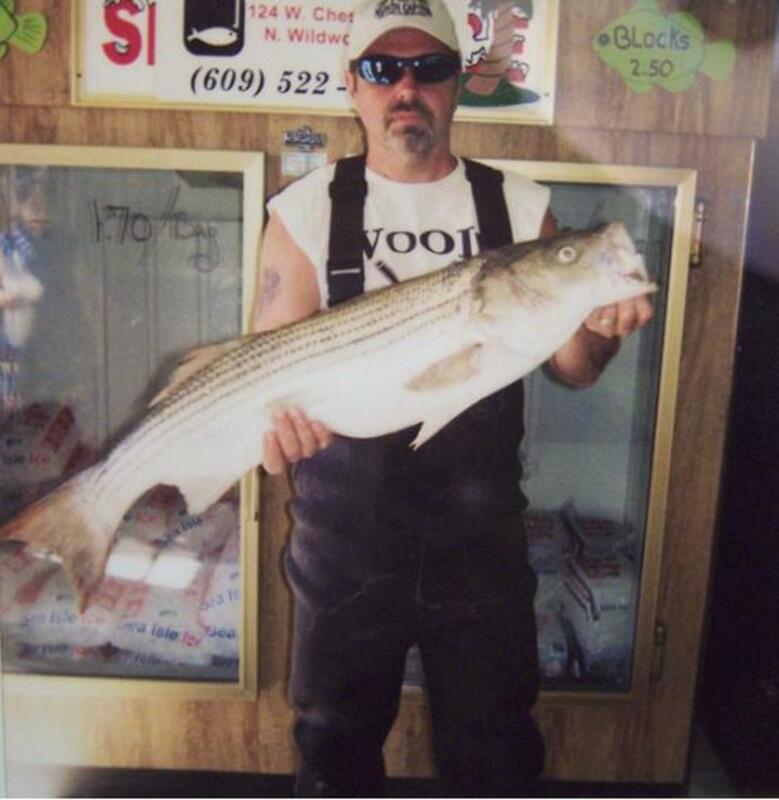 These log books are something every angler should keep as a matter of course, as they prove invaluable tools to fisherman and can make the difference between a successful fishing trip or just a nice boat ride. While local conditions mean trial and error is the only way to locate sheepshead, I can at least give you some pointers here. When the water gets very warm, sheepshead tend to congregate on and around structure in deeper water. So in when the water is warm, target deep-water docks and bars, and reefs and oyster beds in deeper water. When the water gets very cold, the fish tend to congregate either in deep-water spots or the mouths of rivers and streams; also, during the cool weather months that you will see some numbers of sheepshead living in fresh water, which tends to be a few degrees warmer than salt water. When water temperatures are in between warm and cold, the fish tend to be more spread out amongst all available structure. This makes them somewhat harder to find in good numbers, and many anglers prefer to target other species of fish in the late spring and summer anyway. Look for pilings and oyster bars in brackish areas during the summer months; these are breeding areas for the crabs that the sheepshead feed on so heavily. Sheepshead also tend to feed more actively during moving tides, so concentrate your efforts on the downstream side of bridges, docks, or other structures. Anyone who has ever sight-fished for sheepshead knows that they can be finicky eaters. One minute they are eating every bait you throw at them then all of sudden someone flips a switch and the bite is dead. Even baits with no hooks in them get ignored. 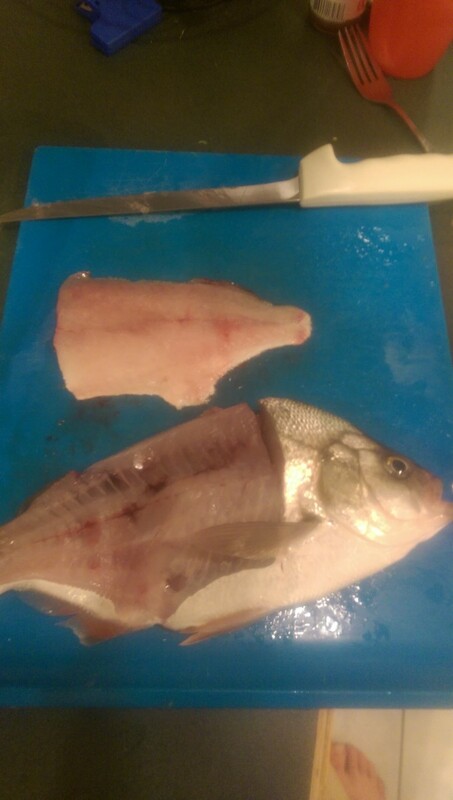 So what makes a sheepshead eat? Tidal movement. The bite will be strongest two hours before and one hour after the tide ebbs or peaks. During slack tides they eat little, if at all. This probably has to do with their diet: small crabs and shrimp get swept down current during a tide change, and barnacles are most active in moving water. Once you have found a likely sheepshead spot, its time to start catching them. Depending on the type of structure and how deep the water is, you should use either a dropper rig or a float rig. Dropper rigs should be used on deeper submerged structures, such as reefs or oyster beds, while float rigs can be used on shallower structures, like docks or exposed oyster bars. A dropper rig may be needed in deeper water pilings when the fish are located near the bottom of the piling; conversely a float rig may be used on vertical structures in deep water when the fish are located closer to the surface. When fishing with a dropper rig, keep a slight tension on the line at all times to feel the bite, which is often subtle. A smaller sheepshead will often nip at a bait, simply eating it right of your hook without the angler noticing! At the slightest "bump," set the hook. 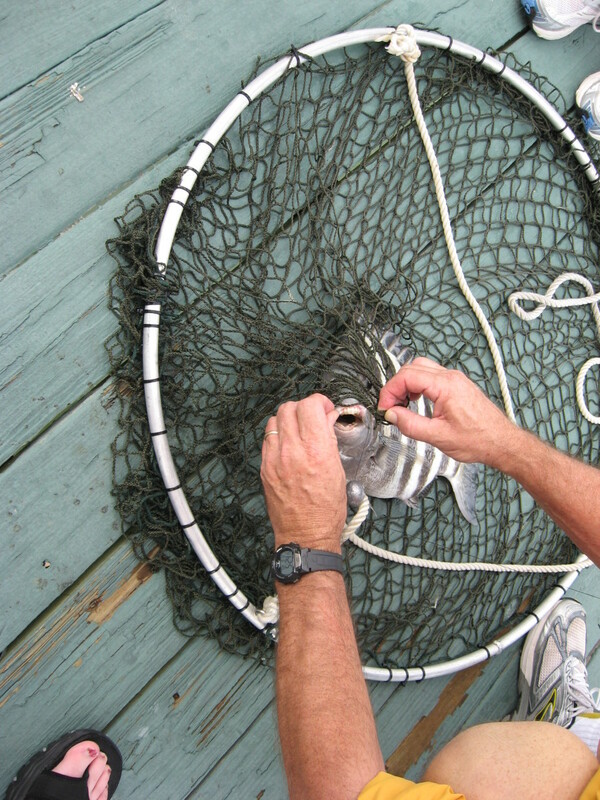 It is often said the key to sheepshead fishing is setting the hook just before the bite is felt. 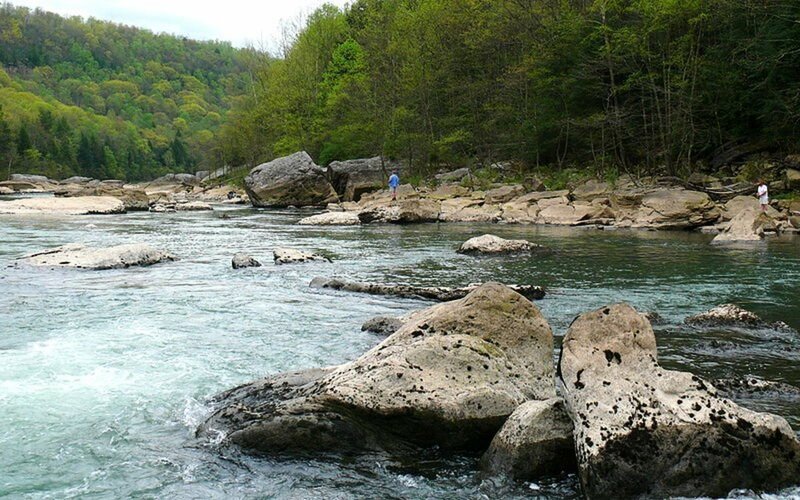 Float rigs alleviate some of this mystery about the bite by use of a visual aid. Once a bait is taken, the float will go under water for a foot or two and then stop. Count to "two-one-thousand" and then either set the hook (if using J-hooks) or start reeling (circle hook). This often leads to a larger-than-normal hook-up ratio than fishing with dropper rigs, since you can actually see the hit. Sheepshead can reach 20 pounds in size, though these fish are very rare. 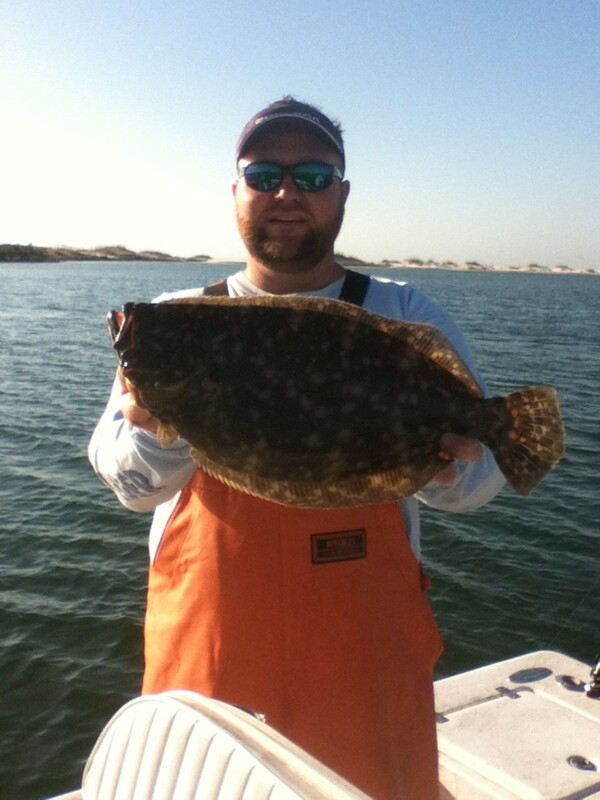 A more common catch will be around two or three pounds, with a five-pound fish considered a good catch. 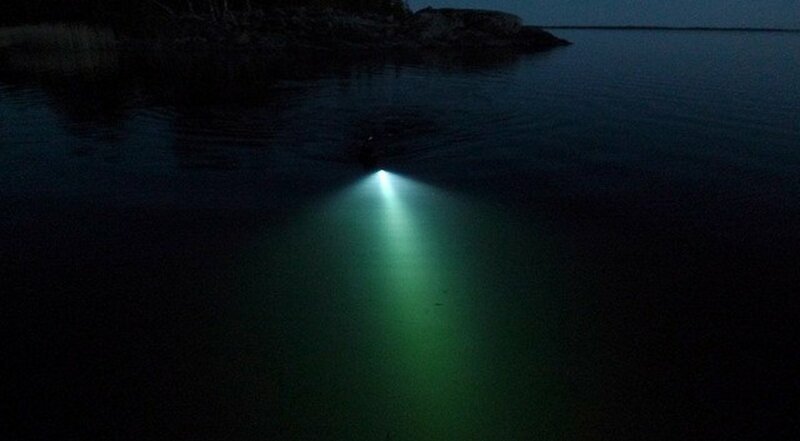 Light or medium light rods are the way to go. Reels should be spooled with 10-15 lb line, strong enough to horse the fish away from structure if he tries to wrap the line around a piling. Hooks should be small because sheepshead have relatively small mouths. Another reason for the small hook is that sheepshead have good vision, and may refuse to eat a bait if they can see the hook. Their good vision is also a reason for using fluorocarbon leaders in the 10-15lb class, to further reduce the gear's profile in the water. A common rig used to catch sheepshead is the dropper rig. This rig can be made a couple of different ways-either using 3-way swivels (which I don't recommend idea for sheepshead because it puts too much "jewelry" in the water) or by creating "dropper" loops from the leader material. To make a dropper loop use either a blood knot (preferred but can be difficult for the beginner to tie) or a double surgeon knot. I like to cut the dropper loop near the mainline and snell my hook to the longer tag end. At the bottom of the rig attach the smallest weight that will keep your bait in the strike zone. Another rig you can use for sheepshead is a float rig. This rig is simply a float attached 18-24 inches above the hook, and is useful when fishing near vertical structures or shallow water oyster beds or rock piles. This rig has the added benefit of allowing you to more easily detect strikes, though it is not generally useful when fishing deeper water reefs or rock piles. The last rig I use when fishing for sheepshead is a slip-lead rig. Use the smallest egg sinker that will get your bait down to the fish. When using this rig I like to use a relatively long leader, about 36 inches in length, sometimes as much as 60 inches if I am fishing clear water and the fish are being picky. The best baits for sheepshead fishing are fiddler crabs, followed by clams and then shrimp. 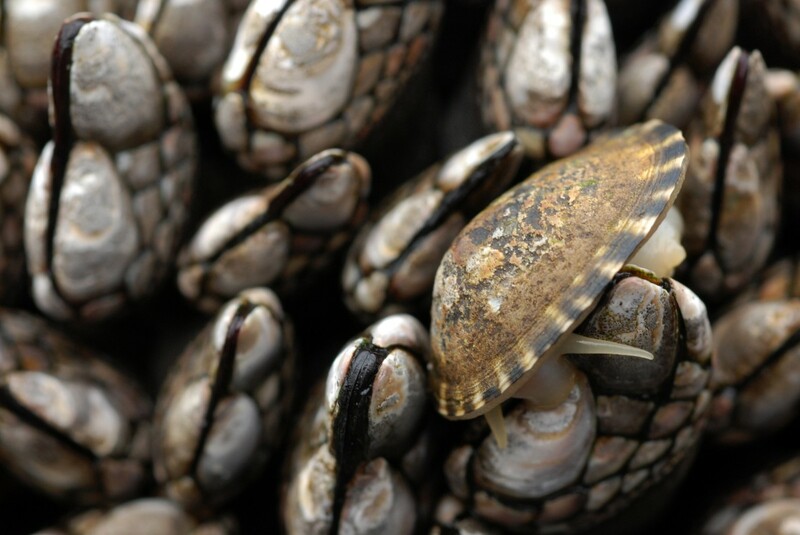 While clams will produce just as many hits just as fiddler crabs, clams are much easier for these fish to steal off the hook. Likewise, shrimp is also a good bait for sheepshead, but every other bait-thieving fish in the ocean also likes shrimp, and pinfish and other bait-stealing fish generally get the shrimp long before a sheepshead has a chance to eat it. Other good baits for sheepshead are oysters, barnacles, and sometimes squid. 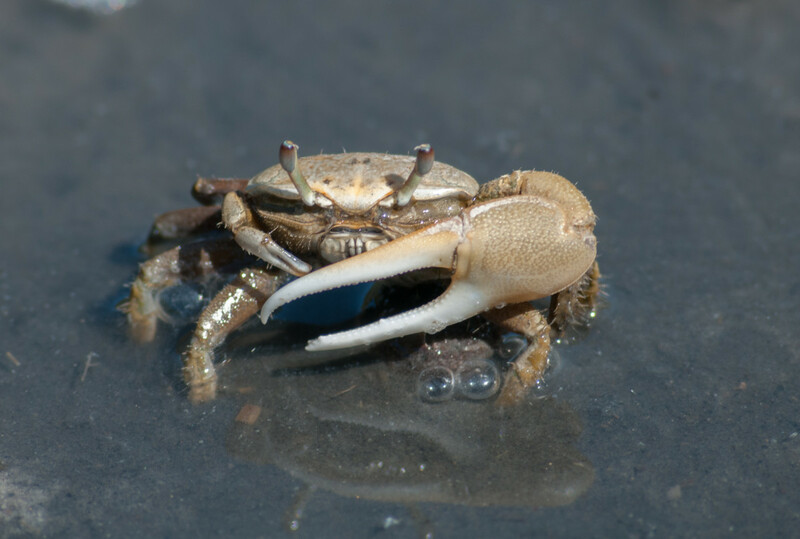 Fiddler crabs are one of the best baits to use when fishing for sheepshead. It is debatable whether removing the large claw from males leads to more hits or not, but it does lead to fewer fingers getting pinched. Any small crab is good bait for sheepshead; however it is often difficult to tell what species a small crab really is, and using any undersized juvenile crab of a species with harvest size restrictions can land you in some pretty hot water. Unless you are absolutely positive about a crab's ID, don't use it for bait. Not only can you get fined, those crabs are protected for a reason and shouldn't be used for bait. Fiddler crabs, on the other hand, are easy to identify. They form large communities in marshy areas and the males have one over-sized claw to attract females. They are easy to collect and are relatively cheap to purchase at bait shops. Use small red cloth balls from craft stores above your baits. Use the smallest ball you can find, and red is the ideal color. Soak the cloth balls in clam juice or something similar, so the smell is impregnated into the cloth. When the sheepshead takes the bait, it sees and smells more "bait" on the hook, and often will make a second attempt, trying to eat the ball. This gives you two chances to get a hook-set, and often the second strike is stronger than the first since it is harder for the sheepshead to take the cloth ball off the hook. If you are having trouble feeling the hits with your rod, lightly rest your finger on the line to enable you to feel the slightest nibble. The line will telegraph the hit even better than the rod will, enabling you to feel more strikes. Use a lighter weight, or no weight at all if your bait will still sink to the fish. This has two benefits: you will feel the strike easier, and the fish will feel less resistance when it takes the bait. To fire up the sheepshead, try chumming. A mesh bag filled with crushed shrimp heads, oyster shells and clam juice will make a very nice chum line that sheepshead will find hard to ignore. Set up shop up-current from the structure you are fishing and let the fish come to you. Use a rake or shovel to scrape barnacles off a structure to use for chum. Avoid using long-shank hooks. Long-shank hooks are not only more visible in the water, reducing strikes, but also are more easily bitten in two by a sheepshead. Polarized glasses can often help improve your chances of hooking these notorious bait stealers. A good pair of quality glasses will allow you to see the sheepshead eat the bait; they are easy to spot with their distinct vertical stripes. Then it is simply a matter of setting the hook and bringing home your dinner! In darker colored water, a yellow pair of glasses helps increase contrast; In lighter colored water, the blue or green tints are better at reducing glare.